Robert DeNiro put on sixty pounds during the course of filming, probably by swallowing all that Hershey's syrup Martin Scorsese used for blood in the brutal black and white fight scenes. 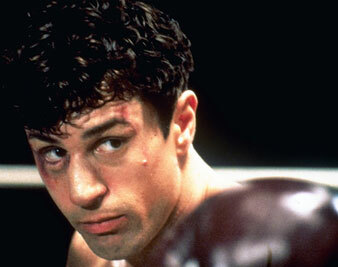 Robert DeNiro in Raging Bull, 1980. Stars: Robert De Niro, Joe Pesci, Cathy Moriarty. Robert DeNiro put on sixty pounds during the course of filming, probably by swallowing all that Hershey’s syrup Martin Scorsese used for blood in the brutal, black-and-white fight scenes. Toward the end of Raging Bull, Jake La Motta (Robert De Niro) smashes his head against a jail-cell wall and moans, “I’m not an animal!” It’s a cry that goes back at least as far as Caliban, and it misses the point. We are all animals, and the interesting question is how well we comport ourselves as members of that order. Generally speaking, we are less capable than other fauna: by comparison with human beings, there are relatively few failures among the cats, pigs, squirrels or raccoons one encounters. Some millenniums ago, man attained free will, and soon began to devise ingenious ways of abusing the gift. This brief excursion into comparative biology is evoked by the fact that Raging Bull explores the subject so effectively. The three people who dominate the film—Jake, his brother Joey (Joe Pesci) and his wife, Vickie (Cathy Moriarty)—are all handy enough with tooth and claw, but only Jake loses the aspect of humanity in the excesses of his rage. The wolverine is reported to behave so by its nature, but a man of that sort is called nuts. It is the verdict brought against Jake, and the others leave him to his fury—a rogue elephant proclaiming himself no animal. Raging Bull recalls, how accurately I do not know, the personal life and professional career of the man who was barred from the ring for throwing a fight, came back to be middleweight champion and was beaten into retirement by Sugar Ray Robinson in the last of their several meetings. He then grew fat (De Niro is said to have gained fifty pounds) and became an aggressively vulgar nightclub entertainer. His brother, who had been La Motta’s manager, broke with him; his wife left him, taking their children with her. If there was a happy ending to this saga, it is not recorded on the screen. From this disastrous and brutal history, Martin Scorsese has made a brutal, discerning and bleakly beautiful picture. Like Godard ‘s recent Every Man for Himself, the craft of film making is itself a participant in the work. The prizefight scenes, though derived, I feel sure, from newsreel footage and perhaps from actual La Motta bouts, are heightened beyond reality by horrifying closeups and the addition of flaring light and numbing sound to expose the gladiatorial essence of the sport. They are precisely accurate but stylized and framed to display what one’s eyes might absorb if they were capable of total sight. These passages have a plastic beauty that prevails over the bloody spectacle they celebrate. And Scorsese, who also made Mean Streets, is tender with, and implacably unsentimental about, the Italian-American society in which Jake La Motta was raised. It is warm, sustaining and authoritative; it is male-dominated and fiercely protective of its women; it breaks the law but adheres to the code. Scorsese sketches into the background of his film both the vivacity and the clubhouse dictatorship of this way of life. La Motta did not rebel against custom or break out of it; he remained within the tribe and flouted its taboos, at the urging of his increasingly domineering impulses. When one of his rages is rising within him, the action around Jake slows and stills, as though by force of will he were commanding time to loiter, the better for him to pounce on his prey. It is a daunting experience to look out on the world from La Motta’s mind; you sense what it means to go berserk. The brother and the wife are played by new actors (it is Moriarty’s first role) who precisely understand and eloquently convey what they are. They are tough, loving, faithful to their humanity and to the dictates of their clan. Above all, they are strong enough to survive the experience of Jake La Motta. These two, outrageously rude, often funny and ever quick on the trigger, leave an afterglow of hope on this account of human failure. The picture is in black and white (except for a brief, gaudy passage of home movies). Its texture is often as grainy as its subject matter, but always beautifully modulated in tones of gray. We lost a good deal when we accepted the soft blandishments of color film. Michael Chapman is director of photography.